We are looking forward to hosting the folks from Whipped & Beaten Bakeshop, Sunday December 16th, 2-5pm. You bring your smiling face, your family and friends, and come have a beer while constructing your ultimate gingerbread house! How it works: Buy a house, add on a gingerbread family, pets, and maybe some fantasy characters, RSVP so we know how many to expect. Show up with your ticket(s) at 2 pm to gather your supplies, and get to decorating! We’ll provide instructions, and will also be around to help you out if you need construction or decorating advice. 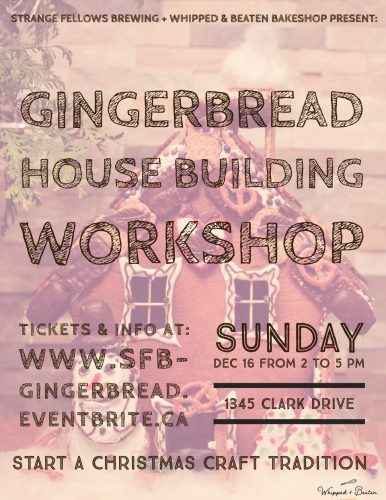 Dec 16 2018 2-5pm ,They will be providing everything you need to assemble and decorate your own gingerbread house: gingerbread pieces, frosting, candy, board a box to bring it home in, and some holiday spirit.